A few years back, I bought myself a Fitbit pedometer, downloaded MyFitnessPal and set out to lose just over 3 stone by the following Christmas. I reviewed the FitBit part way through my mission and remarked on how the app and website presented my goals and achievements in a way that really motivated me. Now, two years on, whilst the Fitbit continues to motivate me (my wife investigated the wider success rate of pedometers here) and I'm averaging just short of 10,000 steps per day, the deletion of MyFitnessPal and the calorie counting has lead to some disappointing weight gain. Throughout 2013, I was so pleased with myself and my continued good behaviour that I wrote a follow up article about the technology I was using to help me keep the weight off. Looking back, whilst those tips were hopefully helpful, I think it was just as much down to good habits. Whilst I accept that I'm going to have to watch the snacking, I'm in no mood for a full diet, so I've decided to attempt to solve this by buying an exercise bike. Why? Well, they’re convenient (you don’t have to leave the house), they’re cheap compared to a gym membership and they have computers that give me the stats that motivated me so well last time. Gadget box ticked! There’s no denying that they’re also bulky, boring and end up in the spare room acting as an awkward clotheshorse - so I had to be careful to choose one that I would actually use. 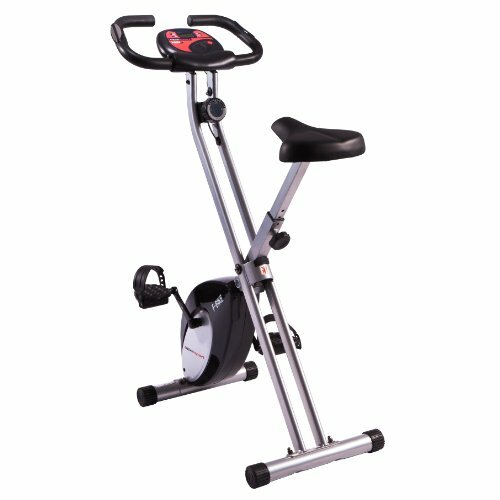 It’s easy to get sucked into buying something all-singing-all-dancing in the belief that the best bike will automatically lose you loads of weight - but those big gym style machines are only ever going to end up in a back room (for most of us) and who wants to spend an hour in there every day? I'm certain that this is the reason most purchases are a waste of money. 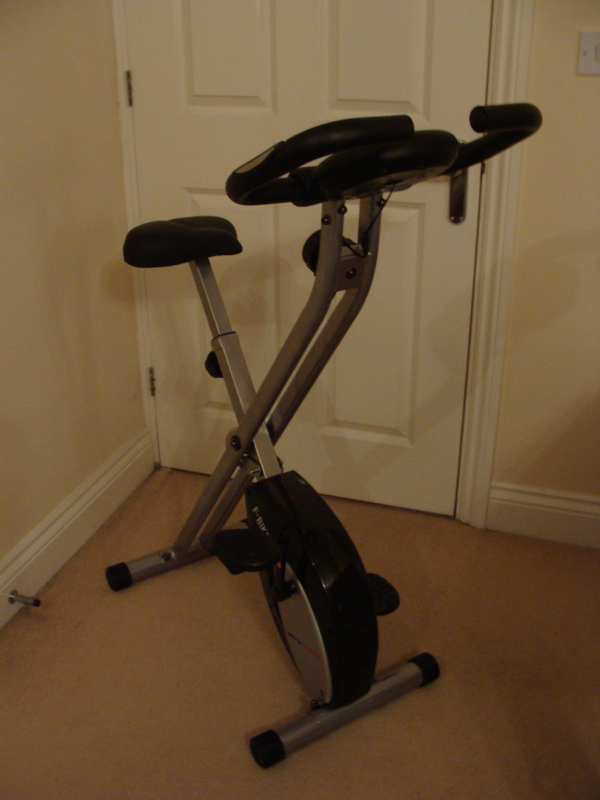 After a spot of research, I ended up taking delivery of the UltraSport F-Bike Exercise Bike from Amazon. At £89, it’s cheap enough that if it ends up being a clothes horse, it’s at least not broken the bank. The UltraSport is a folding bike and whilst it’s not light, it’s easy enough for one person to lift. For me, that meant I could use it in-front of the living room TV and park it in the understairs cupboard when not in use. The second big advantage the UltraSport has, is that it’s near silent in operation. 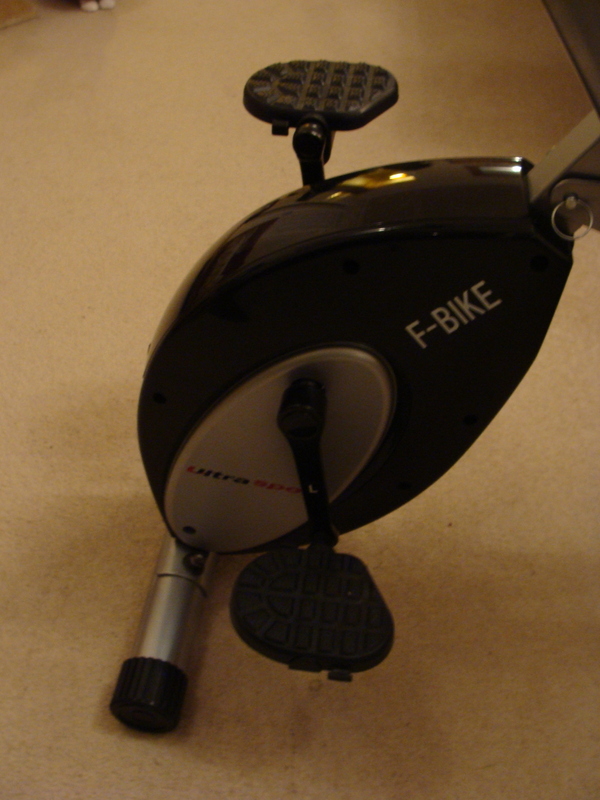 The pedal unit is all self-contained and under that black plastic is a magnetic drive that has 10 stages of resistance. There are no clever computer programs to simulate an undulating surface, but you can dial it up and down yourself as you go easily enough. Silence means that you can hear the TV or music with ease and you’re also not disturbing people around you. Everything you need including a heart-rate monitor, so you know you're working! Although the computer doesn’t have any programs, it does offer everything else you need. It has an odometer (in km), distance for current session, ride time, calories burned and a heart rate monitor, so you can get yourself into the fat-burning zone. I'm able to record my exercise in the Fitbit app, so I'm hoping this will continue to motivate. After all, it’s a little easier to refuse a chocolate bar when you know its calories will cost your entire evenings ride! Two weeks in, I've clocked up a few hundred kilometres and I'm well into Game of Thrones (Community Season 1 when I feel like a shorter ride) and enjoying the bike a lot. If you’re in the mood for improving your health a little, without spending too much, I can recommend the UltraSport. It’s well made and comfortable to use. I just have two more tips to keep the mind occupied whilst the legs spin. First, get a grippy pad. These ingenious pads create a sticky surface without glue or residue. Use the sticky pad to grip your mobile phone to the bike. Now you’ve got the web, YouTube and social networking to keep you entertained whilst you get fit! Secondly, probably not by design, I found my remote sits very conveniently in the bike’s frame, keeping them close to hand for channel changing without having to stop (although perhaps the excuse would be nice!?). A lot of my gadgets have me glued to the sofa whilst a screen transports me off into cyberspace. The UltraSport bike transports me no where at all, but with a couple of accessories, I hope it will be a good enough gadget to get me back to ideal weight.